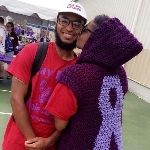 Please consider joining my team in the annual Walk to End Lupus Now South Jersey, taking place in Ocean City, New Jersey. It is estimated that 1.5 million Americans and 10,000 individuals in Southern New Jersey have lupus. Lupus is an acute and chronic (lifelong) autoimmune disease in which the immune system is unbalanced, causing inflammation and tissue damage to virtually every organ system in the body. It is complex, and no two cases of lupus are the same. After more than 50 years of no new treatments for lupus, recently a new drug has been approved. This is wonderful news; however, we need an arsenal of new safe treatments to conquer lupus because the new treatment is not for all people with lupus. There is hope on the horizon, and with your help, we can find additional better treatments and a cure for lupus. The Lupus Foundation of America, Inc. (LFA) is the foremost national nonprofit voluntary health organization dedicated to finding the causes of and cure for lupus and providing support, services, and hope to all people affected by lupus. The LFA and its nationwide network of nearly 300 chapters, branches, and support groups conduct programs of research, education, and advocacy. Thank you in advance for helping me AND the Lupus Foundation of America, Philadelphia Tri-State Chapter! I know we'll all feel good about supporting this important cause!